Item # 317061 Stash Points: 595 (?) This is the number of points you get in The Zumiez Stash for purchasing this item. Stash points are redeemable for exclusive rewards only available to Zumiez Stash members. To redeem your points check out the rewards catalog on thestash.zumiez.com. Treat your car to some new fragrance with the Stickie Bandits Trendy Air Freshener. 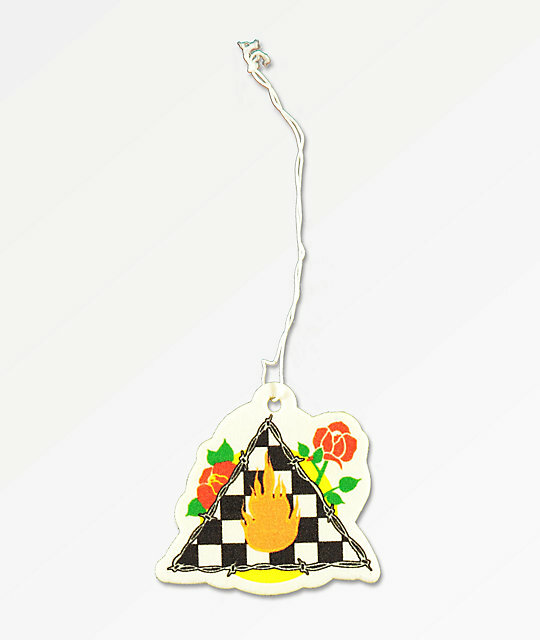 Featured with a double sided graphic of a barbed wire triangle, checkered print pattern, a large flame and rose images, this quirky accessory provides an eclectic edge to any automobile interior. Trendy Air Freshener from Stickie Bandits. Stickie Bandit's "Tropical Vape Juice" Vanilla scent. 2.75" x 2.75" | 7cm x 7cm (approx. ).